Euro Games Technology have followed up their original release of Oil Company with this new version which has 5 reels and 40 pay lines. 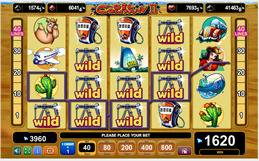 The game has Wilds, Scatters and Free Spins and includes a Gamble “double or nothing” feature. You will also see that there are four Progressive Jackpots termed Gushers, and they are known for big pay outs. The Gushers are awarded during any spin, completely random, by bringing up 12 playing cards. The value of the different available Jackpots is indicated above the reels and you will notice which suit of cards match the different Jackpots. Once you have chosen your Jackpot your challenge is to turn over 3 cards matching that suit before you turnover 3 of another suit. Do not be despondent if this does not happen -you are still rewarded with a jackpot! The icons displayed on the reels include Tankers, Boats, Planes, Petrol Pumps and the infamous Oil Sheikhs. Lining up at least 3 of these symbols will win money – three Petrol Pumps or three Tankers pay 2000 coins, three planes or boats pay 3000 coins while three Sheikhs can pay 8000 coins! The Wilds in this game are the Oil Drills and they are the ones to play for – you can strike it rich with pay outs of up to 20000 coins and remember they are wild so they can substitute all other symbols to improve your winning opportunities even further.